Common name: Beetle nut, Areca palm, Pinang. Malayalam: Kamuku കമുക്, Adakkamaramഅടയ്ക്കാമരം, Kamungu കവുങ്ങ്,കമുങ്ങ്. 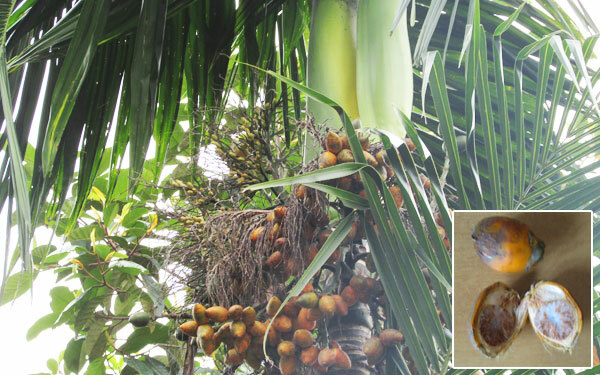 Areca nut tree or Betel nut tree is an erect, tall tree, found in tropical areas, grow up to 60 feet tall, the trunk is strong, segmented, diameter up to 30 cm. Leaves are 7 ft. long, pinnately arranged, with numerous, crowded leaflets, broad leaflets, tip with jagged, dark green in color. Fruits are borne in clusters, which is dark green, turn orange while ripe, sized to about 2.5 inches in long. Alkaloids (Arecaidine and Arecoline), tannin, gallic acid, volatile oil, lignin, Arecoline, Arecain, Guracine. Fruit juice is used in the folk treatment of Scorpion bites.